"When we needed advice on our HR we looked at 4 or 5 different outsourcing companies, but Melbourne HR definitely made us feel the most comfortable in their pitch and what they could offer. We have been super happy working with Melbourne HR, our policies have improved, our workplace has improved, everything has improved, and we are looking forward to having a long-term relationship with them. I would absolutely recommend their outsourcing services to others." This service involves an expert team from Melbourne HR taking over the human resource function of your organisation, in which they will be responsible for both the administrative work and management of your People and Culture. This cost-effective service will see an expert consultant become a part of your business and work on a range of tasks such as business processes and workforce management, through to long-term strategy. Backed by Melbourne HR technology specialists, lawyers, and senior strategists, your consultant will be able to provide a depth of capability and knowledge that an in-house coordinator could not provide. Melbourne HR delivers direction and solution, where a ‘HR coordinator’ requires management and advice. 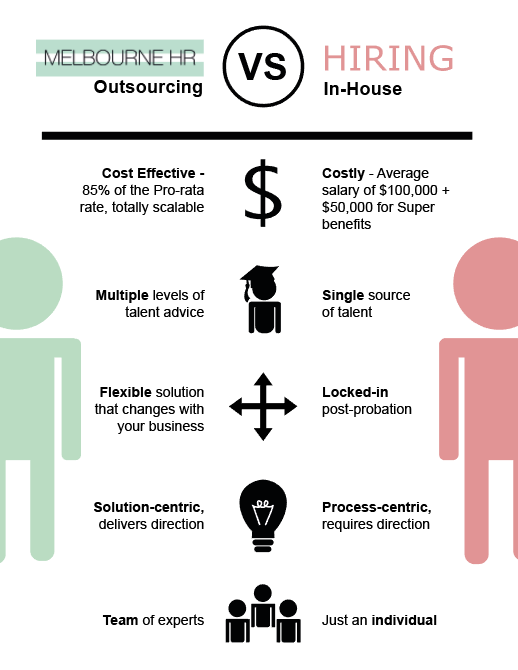 WHY SHOULD I CONSIDER HR OUTSOURCING?